Definition - What does Parivrtta Trikonasana mean? Parivrtta trikonasana is a standing yoga asana that twists the body and demands balance and flexibility. In this asana, the feet are positioned almost as in Virabhadrasana 1 (warrior one pose), with the back foot turned at about 45 degrees and both legs straight. The arms extend, and the body bends so that the hand corresponding with the back foot rests firmly on the inside or the outside of the lead foot. 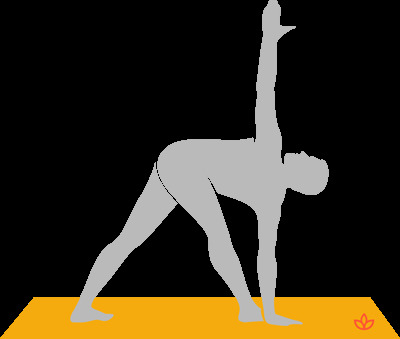 The torso twists so that the arm corresponding with the lead foot reaches to the sky, opening the chest and stretching the side body. This is then repeated on the opposite side. The name for this asana comes from the Sanskrit parivrtta, meaning "revolve," trikona, meaning "triangle," and asana, meaning "posture." In English, it is called revolved triangle pose or twisted triangle pose. Parivrtta trikonasana is an advanced variation of trikonasana, or triangle pose. It is also related to parivrtta parsvakonasana (revolved side angle pose), in which the front leg is bent. Traditionally, parivrtta trikonasana is believed to activate the svadisthana (spleen or sacral) chakra. By energizing this chakra, the pose opens the practitioner to creativity, pleasure, and feelings of self-worth and joy. It ignites passion, stokes the digestive fire, and can even help awaken kundalini. Those lacking the flexibility or balance to practice the full expression of this pose may use a yoga block to support the arm reaching toward the ground.